The Mad Hatter and March Hare are characters from Kingdom Hearts χ. They host a tea party in Wonderland. Player arrives at the Mad Hatter and March Hare's tea party. In search of Alice's whereabouts, the Cheshire Cat directs Player to see the Mad Hatter and the March Hare. Arriving in their garden, Player discovers the pair about to celebrate their unbirthday. When the March Hare notices Player, they proclaim that there are no seats available and thus Player could not join them. However, when Player prepares to leave, the Mad Hatter and the March Hare offer them to stay for a cup of tea. Player agrees to join them, and the two friends give them a cup that the Mad Hatter fills with sugar. The Mad Hatter realizes that there is more sugar for him and the March Hare, and asks Player to pick up two cups of sugar, as well as butter and jam. After Player returns with the items, the Mad Hatter and March Hare begin the tea party, only to realize they were already celebrating their unbirthday before Player even arrived. Realizing how much time they lost with waiting for Player to return, they force Player to leave, resuming their party. Shortly before Data-Sora arrives in Wonderland, Data-Alice spotted the world's Keyhole in the court of the Data-Queen of Hearts, but was forced to flee from her soldiers, in the process stumbling upon the unbirthday tea party hosted by the Data-Mad Hatter and Data-March Hare. Her memories of this event, among others, were scattered by the bugs affecting Jiminy's Journal and became Inklings. Data-Sora finds the Inklings regarding the Data-Mad Hatter and unbirthday tea party in the Tea Party Garden, and uses them alongside the others he has found to piece together Data-Alice's memories of the Keyhole. A portrait of the Mad Hatter and the March Hare appear in the Tea Party Garden and one of the buildings in the Second District has a sign based on the Mad Hatter. The Mad Hatter appears as a short, hyperactive man with grey hair, a large nose, and heavy eyebrows. He wears an orange overcoat, a black buttoned-up shirt, green trousers, blue socks, black shoes, a blue bow tie, and his signature green hat. On the right side of the hat is a sheet of paper with "10/6". The number was originally used by Lewis Carroll in the original book to denote the hat's price of “10 shillings and a sixpence", roughly £1.26 in British currency. The March Hare appears as a tan rabbit similar to the White Rabbit, albeit larger. He is shown with blond hair and heavy eyebrows, much like his compatriot. 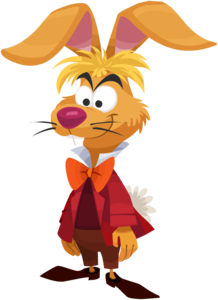 The March Hare wears a red coat, a brown tunic, an orange bow tie, beige pants, and large shoes to accommodate his large feet. The Mad Hatter and March Hare first appeared in Disney's Alice in Wonderland, which was based on the book by Lewis Carrol called Alice's Adventures in Wonderland. Alice first meets the pair at a "Mad Tea Party" where they celebrate their unbirthday (any day that is not a birthday). The pair later appear at the trial where they are used as witnesses to prove Alice's guilt of exposing the Queen of Hearts' heart-print bloomers. They last appear during the chase sequence following the trial where everyone from Wonderland fades away as Alice awakens from her dream. The Mad Hatter's sign in Traverse Town. The Mad Hatter's and March Hare's portrait in Kingdom Hearts. This page was last edited on 6 September 2018, at 22:08.